Jeff is back to talk about the Open Hardware Summit with Chris! YESSAH. The event was held at the Kresge Auditorium at MIT. The night before the summit, we had a tour of Bolt (the hardware accelerator) and had a meetup at the Meadhall. After the event on Friday night, Chris got to visit Artisan’s Asylum, where he finally saw Stompy, the Giant, Rideable Hexapod Robot! On Saturday Jeff visited the MIT museum. It was a great reminder of prototyping methods throughout the years. They also have modern inventions in there, such as the MakeyMakey. The 2013 OSHW Goodie Bag was great this year. Dave and Chris both had a design in there, the uRuler and The Amp Hour Breakout Board (shown above), respectively. Low cost tools continue to get better. The Parallela project was laid out with EAGLE and has multiple BGAs on board. Really there are some features that are only available on the high end tools, but some creep in to the low end ones as well. Jeff loves the PCBs that are reference material as well, such as the uRuler, the Octopart footprint example/resistor color coder and the Sparkfun Silkscreen example board. 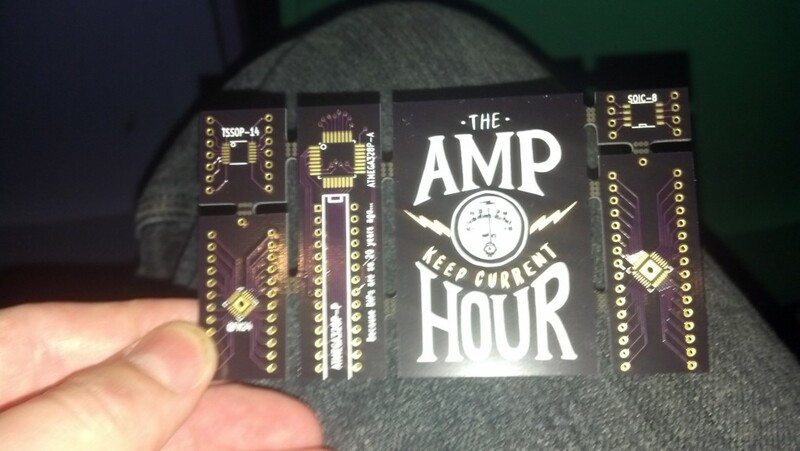 If you’re interested in seeing/downloading/making the files for The Amp Hour Breakout Board, they’re available on GitHub now. Chris is getting into GitHub for KiCAD files (finally). Robert Spitzenfeld wrote a script for GitHub that allows you to do visual diffs, by generating gerbers for each layer and overlaying different versions. Jeff is very excited about what we talked about last week with Michael Ossmann, the Hack RF project. He’s getting one and will learn more about SDR. Chris has recognized that when he has the feeling of threatened, it likely means its something he should be learning. An example would be firmware (or GitHub!) for an analog person because of the increasing levels of integration in silicon. Knobs are going away in RF products because SDR and the variety of digital interfacing now available on rigs. Jeff will be at TAPR in Seattle in two weekends. There is a meetup in Cleveland this Thursday, 9/12/2013. It’s called Charged Conversation and will be hosted with Martin Lorton. Having a meetup in your city? Let us know and we’ll promote it! Next week on the show, we’ll have Upverter on to talk about online CAD tools and the sharing capabilities of their platform. You can see Chris participating in an online build with them for their activity tracker. Ask your questions for them here! Chris also uploaded the rest of his pictures from his trip to his Flickr stream. It was great to have Jeff back on the show! We hope he’ll be able to stop by again soon to talk with Chris and Dave together!